Crepe Stuffed New York Cheesecake is an incredible combo of buttery, ricotta chocolate chip stuffed crepes, and baked into a NY cheesecake. 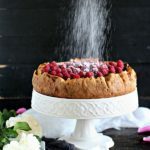 We love making delicious cheesecakes, and among our favorites are Best Instant Pot Cheesecake, Samoa Cheesecake No Bake and No Bake Tiramisu Cheesecake. This Crepe Stuffed New York Cheesecake is not your typical cheesecake. It doesn’t have a graham cracker crust. All the cheesecake filling is being held by buttery layers of crepes! I had this Crepe Stuffed New York Cheesecake in my mind for a while. I was brainstorming recipes and combos when it came to me. Both crepe and cheesecake is something that I love dearly. So I can only make this better by combining the two, which I did and I couldn’t be happier! The crust is made of a few layered crepes, that are covered in New York cheesecake filling, topped with four crepes that are stuffed with ricotta cheese and chocolate chips. I enjoyed baking this Crepe Stuffed New York Cheesecake since it incorporates all the things I love. I am a sucker for creamy, hearty desserts like cheesecake, and I honestly eat crepes on a weekly basis. Having the two together was one of the best decisions I have ever made. I specifically used ricotta cheese to stuff the crepes, because it has a slightly different texture. And I fell in love completely with the melted chocolate chips. Having the crepe layers baked into the cheesecake, gives this cake an amazing texture. Each bite is filled with creamy vanilla bean New York cheesecake, buttery, thin and soft crepes and a sweet chocolate ricotta mixture. 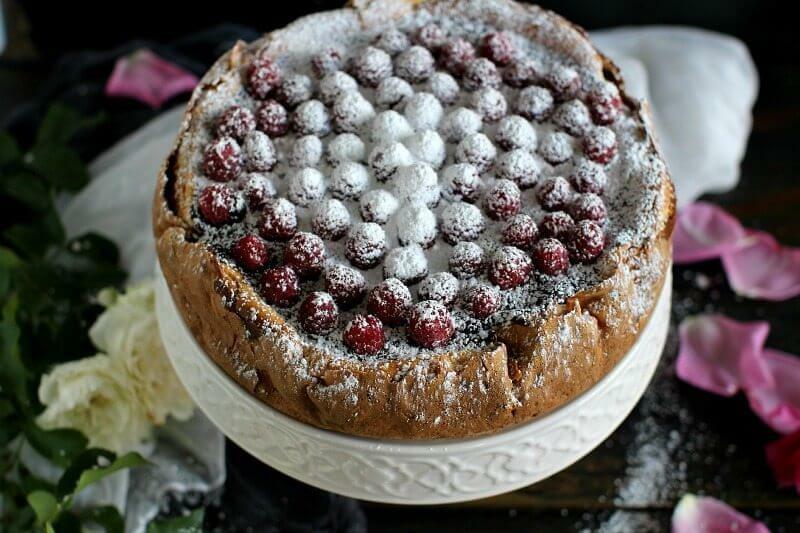 The chocolate on top hardens when refrigerated, which adds a nice crunchy, and the fresh, juicy and tart raspberries, balance the sweetness of the cake and brighten it up. Delicious and beautiful Cheesecake that combines Crepe and Cheesecake in one dessert. Produces a creamy and rich cheesecake that will be a hit with everyone. Perfect for special occasions such as Valentine’s Day. An easy, mess free way to cut even slices is to use cheese wire or unflavored dental floss. Clean the bits that stuck to the wire/floss before very cut. You can freeze the cheesecake BEFORE you top it with whipped cream or any other sauces or chocolate ganaches. Make sure the cheesecake has fully cooled and also was refrigerated for at least 6 hours. Wrap cheesecake tightly with aluminum foil or plastic freezer wrap, or place in a heavy-duty freezer bag. Properly stored, it will maintain best quality for about 2 to 3 months. Place eggs, milk and melted butter in a blender and mix on low - medium speed. If you don't have a blender just whisk by hand until well combined. Add sugar, salt, vanilla bean seeds and flour - one cup at a time and mix in the blender/or whisk until well combined. Let the batter sit at room temperature for 15-20 minutes. 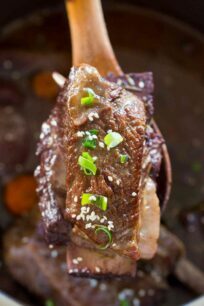 Place a 12-inch non-stick pan very low-medium heat and when hot add a little butter to coat it (less than half of a tablespoon). Pour 1/3 cup of crepe batter into the center of the pan and swirl to spread evenly. Cook for roughly 1 minute or until the edges of the crepe appear to loosen from the pan. Using a rubber spatula, loosed the crepe edges from the pan, now using your fingertips, quickly flip the crepe and cook for another 1 minute, until slightly golden brown. Remove crepe and stack on a plate. Continue with the remaining batter and stack crepes on the plate. Coat the pan with butter as needed. When done cooking, and the crepes have cooled to room temperature, cover them with a kitchen towel to avoid the edges from drying out. 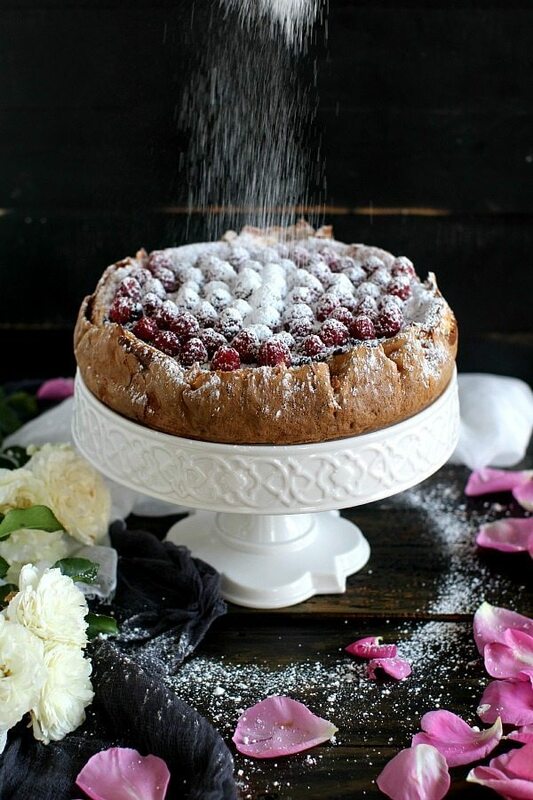 In a medium bowl, using a fork, mix ricotta cheese with the egg and sugar, when combined stir in the flour, after fully incorporated add the chocolate chips. Set aside. In the bowl of an electric mixer, fitted with the wire attachment, mix cream cheese with sugar until smooth. Add the milk, and then mix in the eggs one at a time, mixing just enough to incorporate. Stop and scrape the bowl sides and the bottom of the bowl, using a rubber spatula. Mix in sour cream, vanilla bean seeds and flour until smooth. Spray an 8 inch springform pan with baking spray. Place 2 crepes on the bottom of the bowl and 3 on the sides, to create a crepe crust. Pour half of the New York cheesecake filling into prepared crepe crust. Place a crepe on a working table, place 1/4 of the ricotta chocolate chip mixture a few inches from the side that is facing you, and spread it over half of the crepe. Roll it gently into a tube and place it carefully into the pan on top of the cheesecake filling. Repeat with the remaining 3 crepes. Top the crepes with the remaining New York Cheesecake filling. Bake in the preheated oven for 1 hour. Turn the oven off, and let cake cool in oven with the door closed for 4-5 hours, (make sure it doesn't burn) this prevents cracking. If the cake cracks, don't worry since we are covering it in chocolate so it won't be visible. Once you remove the cake from the oven, the crepe edges that are over the pan will be slightly burned, trim them, and bring the crepe crust to the same level as the cake. Keep the cake in the pan. Bring a medium saucepan half filled with water to a boil. Place the chocolate in a medium bowl set over the saucepan of simmering water, let it melt, stir just a few times. Remove from heat and set aside. 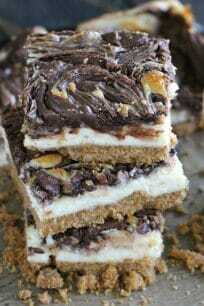 Pour the chocolate on top of the cheesecake, level the mixture with a spatula or spoon. Top with fresh raspberries and refrigerate for at least 4 - 5 hours or better overnight. Before serving, sift powdered sugar on top of the cake and remove from the springform pan. This is a total showstopper! I love it! 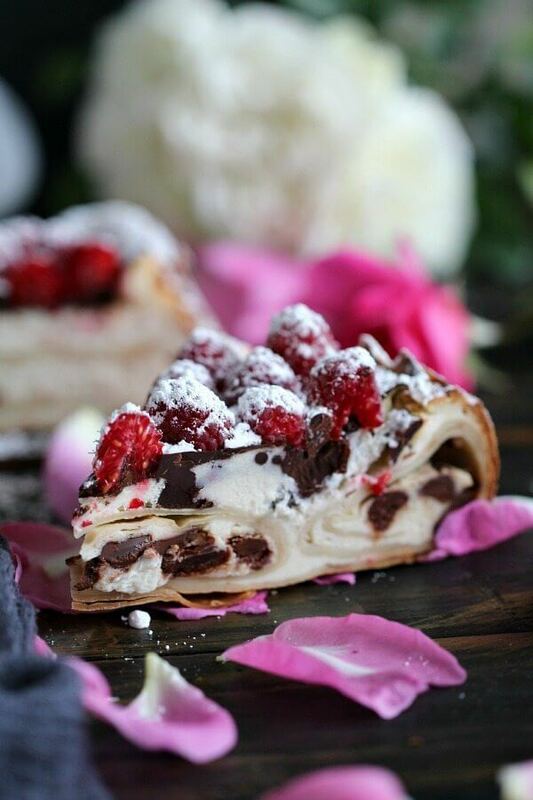 I need to make this, I love crepes so much we make them on the weekends pretty often, this takes them to a whole new level! we make them on the weekends pretty often too, if you love crepes you will love this cheesecake! Oh what a gorgeous cake, Katalina! I’m really craving this for breakfast right about now. Love your creativity! Gale, I had it for breakfast the other day and it totally made my morning 🙂 have a nice weekend! My jaw literally hit the floor when I saw this cheesecake! It’s stunning. And the crepes are genius! What an amazing looking recipe… the picture of my dreams!! So yummy… great job! 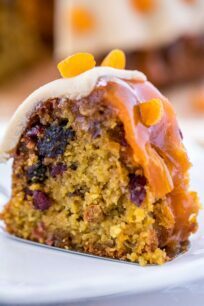 Hope you listen to that little voice and give this cake a try, you will love it! I’ll scream with excitement with you! This looks amazing! Whoa. Crepes and cheesecake? You’re awesome. And they look amazing too. Wow what a cake or cheese cake or crepe!!!! Hehehehe where do I start…AMAZING is not enough really….congrats on having your own and one of a kind cake!!! Love it…gorgeous photos as well..
Holey moley! This looks awesome and those action shots are super cool! Thats the thing Farida, it looks complicated, but it can’t be easier, you just roll the stuffed crepes, place them in the pan and top with cheesecake, I have included some photos to showcase the process, so don’t be afraid, try it! Really I want to! I’ll do my best by first nailing make crepes! My Boyfriend loves crepes but cheesacakes are his favourite desserts, I bet he would go crazy over this combination! 😉 Lovely photos! Stella, you must make this for him, he will love it! I love crepes, cheesecake and chocolate! Your recipe for crepe stuffed New York Cheesecake will definitely be on my list of things to make! Thank you Linda, I hope you like it as much as we did! Awesome photo. Awesome recipe. What else can I say?! OH MY LIFE. SO pretty! Thanks Noor, have a nice weekend! Your photos have really inspired me! Really beautiful especially for the coming holidays. Thank you, I hope you give this cake a try for the holidays! Wow, wow, and wow! The cake as a whole is stunning, but the slice view is just incredible. These pictures look like a dream! 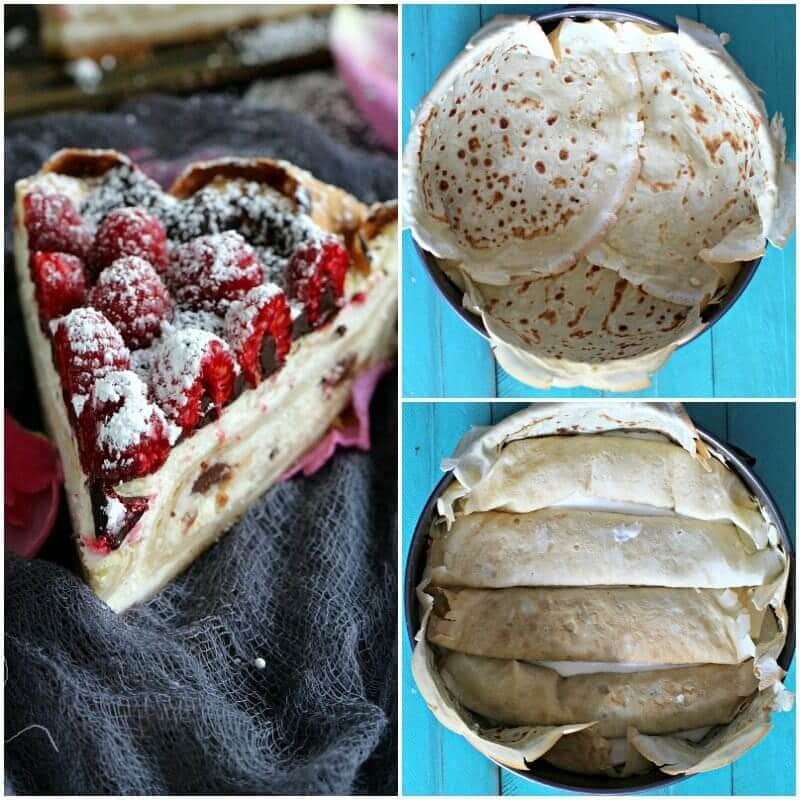 Crepe stuffed cheesecake?!? My mind has been blown! Oh my yum! This looks amazing – what a creative idea!! Stunning photos as well. Oh, this is genius! I love all the elements combined here, what a stunning cake! Pinned! Thank you for the pin love Sara!